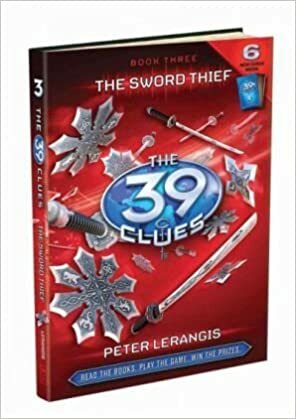 Book 3 in the #1 bestselling The 39 Clues series may just be the most thrill-packed yet! ATTENTION! Amy and Dan Cahill have been located once again, this time in the company of the notoriously unreliable Alistair Oh. Could they have been foolish enough to make an alliance? Spies report that Amy and Dan seem to be tracking the life of one of the most powerful fighters the world has ever known. If this fearsome warrior was a Cahill, his secrets are sure to be well-guarded . . . and the price to uncover them just might be lethal. In the key of C? That’s all we know.” Alistair shrugged, sitting at a laptop. “Not much to go on, but that hasn’t stopped us before. Let’s each work awhile and then compare notes, shall we?” Amy and Dan made sure to sit opposite him, so their monitors were not visible to Alistair. Amy typed into a search bar: japan tungsten sword 87,722 hits. “This is going to be a long day,” murmured Amy. Dan typed: ninja warrior images 1,694,117 hits. He smiled. Maybe it wouldn’t be so bad after all.